Is there a Watergate Scandal Emerging at Volkswagen? Watergate is shorthand for a gradual but remorseless process through which a powerful leader becomes destroyed. Are there parallels in the current scandals at Volkswagen which have resulted in imprisonment for several middle-ranking executives? Will the very top leadership in Germany eventually be brought down? Earlier this week [February 2008] Klaus Volkert, the former head of Volkswagen’s employee council, was jailed for his role in a corruption scandal. was found guilty of incitement to breach of trust in the case, which involved employee representatives getting illegal privileges. We have commented over the last year of the leadership troubles that have been hitting the corporate reputation of Europe’s premier car manufacturer. … the financial markets have absorbed the uncertainties regarding VW’s less secure future when and if the Volkswagen protection laws are removed. They are also unshaken by the leadership scandals, and by the risk that VW is falling behind Toyota in the development of its hybrid car range. (Strictly speaking, that is a wider concern for the future success of the German premium automobile marques, VW’s Audi, but even more so, BMW and Mercedes). At least Martin Winterkorn seems to be enjoying a leadership honeymoon. Martin Winterkorn appears to have been parachuted in as someone untained with earlier scandals. President Nixon’s downfall is now a classic of modern cultural mythology. The great leader is brought low, despite all efforts he made to protect himself. At first, only the minor players in the drama are attacked. But as each each in turn is weakened, it becomes easier for a more important figure to come under attack. The drama is sustained with the prospect of defeat for the most powerful figure of all. Are we witnessing at Volkswagen a story that is gradually working its way towards the very highest of executives associated with the scandal? I can only observe that denials are being made. The denials may be a necessary strategy to protect individuals from the hints that are emerging in the press. Until something more substantial emerges, I shall not be naming names. The Volkswagen organisation has faced downsizing challenges in common with the majority of auto-manufacturers in recent years. As these changes unfolded, the company became embroiled in leadership battles familiar to students of the dramas of William Shakespeare. The German business governance system also has to be studied to understand some of the key contextual factors involved. The original filing was updated with the news that Peter Hartz, the official at the centre of the bribery scandal has been given a two year-suspended prison sentence. Peter Hartz goes to court today to face charges of illegal payments to Union officials. Hartz was formerly head of personnel at the VW corporation. He had also been an influential figure in labour policy changes introduced by the former German chancellor, Gerhard Schröder. The story was a high profile one in Germany when he resigned from Volkswagen in July 2005, accompanied by lurid accounts of sexual shinnanigans. corporation has encountered a range of further leadership problems. A few months ago, Volkswagen chief executive Bernd Pischetsrieder stepped down under unclear circumstances. Then an announcement was made that Wolfgang Bernhard is to leave his post as chairman of the Volkswagen brand group by the end of January 2007. 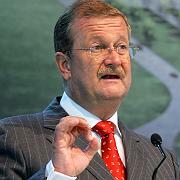 The former chief executive, Bernd Pischetsrieder, brought Mr. Bernhard, a former executive at DaimlerChrysler, into Volkswagen in October 2004 as part of his plan to cut costs at the automaker. Mr. Bernhard pushed through plans to cut 20,000 jobs and extend the workweek during the course of 2006. But in the process, he alienated the powerful Volkswagen union, IG Metall, which is also closely allied with Volkswagen’s chairman, Ferdinand Piëch. When Mr. Piëch, together with Porsche, a major Volkswagen shareholder, pushed out Mr. Pischetsrieder in favor of Mr. Winterkorn in November, Mr. Bernhard was left vulnerable to the same fate. The organizational leadership literature has gone some way from the original trait models, in which the great leader was presented as having special qualities through which he (almost always he) achieved great transformational change. Among other weaknesses, these models considered that the leader was the causative force for change. Later models considered that there were situational factors which would influence leadership practices. However, the models still had a linear character, with the leader triggering change. Professor Yukl has been one of the minority of leadership authorities warning against the simplicity of such models. What seems to be happening at VW is a leadership drama in which the vested interests play out their parts in a way familiar to students of Shakespearean tragedies. No wonder that Leadership courses have turned to Shakespeare to throw light on contemporary business issues. This week (Thursday 2th January) it was reported by the BBC that Peter Hartz has been given a two year-suspended prison sentence. Hartz, a guiding hand behind former German Chancellor Gerhard Schroeder’s labour reforms, was fined 560,000 euros ($726,000; £369,000). The former head of personnel at Europe’s biggest carmaker escaped jail after cutting a deal with prosecutors. You are currently browsing the archives for the VW category.